After losing the Syracuse, Rochester, and Toledo franchises to the American Association, the International Association opened its 1890 season with only six teams. Five were holdovers from the previous year: Detroit and Buffalo in the US; and Toronto, London, and Hamilton in Ontario, Canada. One was a new Michigan franchise, the humorously named Saginaw-Bay City Hyphens. The game was preceded by a grand parade through the streets of Toronto. A brass band led the way, and the ballplayers followed in horse-drawn carriages. At the ballpark, after the teams’ pregame warm-ups, Toronto Mayor Edward F. Clarke made a welcoming speech and ceremoniously tossed a baseball onto the field. Wesley Curry, “a steady, reliable umpire,”6 was the game’s sole arbiter. The Detroit lineup featured a first-rate infield. 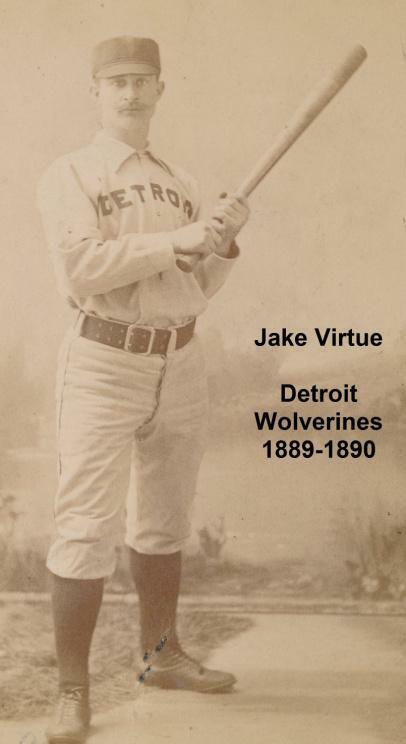 Jake Virtue was regarded as one of the best-fielding first basemen. Bill Higgins, the second baseman, could “make a double play as quick as anyone.”7 The speedy Bobby Wheelock covered a lot of ground at short. Jim Donnelly, the third baseman, was the team captain. In the Detroit outfield were Harry Hulin in left, George Rhue in center, and Count Campau in right. The battery was pitcher Edgar Smith, a 27-year-old right-hander, and catcher Mike Goodfellow. Smith had posted an 18-9 record for the 1889 Wolverines. He was “a quiet, intelligent, gentlemanly fellow”8 and a good hitter; Leadley placed him sixth in the batting order. The Toronto battery was pitcher Ledell Titcomb, a 23-year-old southpaw, and catcher John Grim. Titcomb had compiled a 15-13 mark for Toronto in 1889. The Toronto infield was composed of Pete Wood at first base, Tom McLaughlin at second, Albert Ike at short, and Chris Rickley at third The outfield was covered by Denny Connors, Billy Bottenus, and John Coleman in left, center, and right field, respectively. The defending champions had prepared for the new season by playing a number of preseason games, but the Torontos had played only one.9 Five men in Toronto’s Opening Day lineup (Wood, Ike, and the entire outfield) were new to the club, so the Torontos opened the season with little experience playing as a team. Two sacrifices and three singles, including a base hit by Smith, netted two runs for the Wolverines in the bottom of the third to knot the score. In the next inning, the Torontos were sloppy on defense as the visitors rallied for four more runs. Rickley and McLaughlin muffed infield popups. Higgins doubled in the inning, and Wheelock and Campau contributed singles. Leading off the fifth inning, Grim grounded to Donnelly, who threw errantly to first, enabling Grim to get aboard. Bottenus grounded into a force out, advanced to second base on Wood’s sacrifice, and scored on Connors’ single. With McLaughlin at the plate, Smith delivered two wild pitches, allowing Connors to reach third base, and McLaughlin’s single brought him home. The Torontos had cut Detroit’s lead to 6-4. Grim led off again in the seventh inning and repeated a grounder to Donnelly. This time Donnelly’s throw to first base was accurate, but the usually-sure-handed Virtue dropped it. Bottenus singled, sending Grim to third base, and Bottenus stole second base. When Smith fanned Connors, Goodfellow dropped the third strike and unleashed a wild throw to first base that went into right field, where it was collected by Campau. Grim scored, but when Bottenus also tried to score, he was nailed at the plate by Campau’s “splendid throw” home.12 A single by McLaughlin scored Connors, and the game was tied, 6-6. Smith tripled in the bottom of the seventh for the Wolverines, but Titcomb fielded Virtue’s tap and collaborated with Grim and Rickley to nab Smith in a rundown between third and home. Virtue, however, reached third base on the play and scored after McLaughlin fielded Hulin’s grounder and threw wildly to first base. Detroit led, 7-6. Bothered by a sore arm, Donnelly was replaced at third base in the top of the eighth inning by Jake Wells, Detroit’s backup catcher. Wells immediately muffed Ike’s popup but atoned for it by starting a 5-4-3 double play later in the inning. The Wolverines tacked on three more runs in their eighth on singles by Higgins, Campau, and Smith, and two errors by Ike at short. Smith then retired the Torontos in order in the ninth, and the ragged affair was over. The final score was Detroit 10, Toronto 6. The Wolverines won their first nine games of the 1890 season15 and were the clear favorites to win the pennant, but the International Association folded on July 10. Several Detroit players were signed by major-league clubs. Campau, Higgins, Donnelly, and Wells went to the St. Louis Browns of the American Association, while Wheelock went to the Columbus Solons in the same league. Smith and Virtue joined the Cleveland Spiders of the National League, and Leadley became the Spiders manager on July 26, 1890. In Leadley’s 10th game at the helm, Cy Young made his major-league debut in an 8-1 victory over Cap Anson’s Chicago Colts. Joe Gonsowski provided the Jake Virtue photo. In addition to the sources cited in the Notes, I used the International Association page from the Bullpen section of the Baseball-Reference.com website. Neither Baseball-Reference.com nor Retrosheet.org have yet extended their digitized box score coverage as far back as 1890; I used the box score for this game from the May 2, 1890, Detroit Free Press game story cited in Note 4. 1 “Opening of the International League Championship Season,” Toronto Mail, May 1, 1890: 2. 2 “The International League,” Buffalo Express, May 9, 1890: 6. 3 Although Baseball-Reference.com refers to the team as the Toronto Canucks, contemporary newspapers refer to the team as the Torontos. 4 Detroit Free Press, May 2, 1890: 2. 6 Toronto Mail, May 2, 1890: 2. 7 “The Crack of the Bat,” Detroit Free Press, January 20, 1889: 3. 8 “Gossip,” Detroit Free Press, September 18, 1889: 2. 9 Toronto Mail, May 1, 1890: 2. 10 Detroit Free Press, May 2, 1890: 2. 11 Toronto Mail, May 2, 1890: 2. 15 “The International,” Sporting Life, May 24, 1890: 12. 16 “Here’s Pitching for You,” Democrat and Chronicle (Rochester, New York), September 16, 1890: 6.